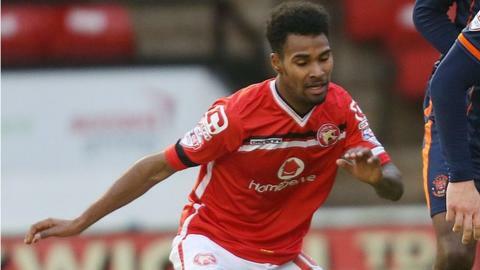 Walsall head coach Sean O'Driscoll says they have to be "careful" in their handling of England Under-19 international left-back Rico Henry. The exciting teenager, 18, has missed the promotion-chasing Saddlers' last two games with an ankle injury. Henry sat out a 2-1 home loss to Wigan Athetic before 'tweaking' the injury which left him benched for Saturday's goalless draw at leaders Burton Albion. "He's had problems with his ankle since I've been here," said O'Driscoll. "We've just got to be careful with him. He trained on Thursday, then he trained on Friday and tweaked his ankle again, which is why we had to pull him out of the previous game. And you've got to train to play." Although frustrated by a run of one win in six league games, and no wins at home in four this year, which has seen the Saddlers drop six points behind top spot, O'Driscoll remains patient. And he insists that making unnecessary loan signings would fly in the face of the home-grown philosophy developed under previous boss Dean Smith. "Rico's got a fantastic future," added O'Driscoll. "He's got a great attitude. He plays with no fear. It's part of his development. He's been allowed to play. "There's one or two others here who, at another club, would have been left by the wayside, but here they get a chance. That's the ethos of the club. Loading us with three or four loan players would be throwing that philosophy out of the window." Henry has been watched by a lot of clubs this season and is reportedly a target for both Arsenal and Tottenham Hotspur. O'Driscoll also highlighted Saddlers skipper Adam Chambers, who is still going strong at the age of 35 in his 15th season as a professional, as an inspiration to Henry and the promising young players at Bescot. "Do the right things," he said. "It doesn't matter whether you're 18, 28 or 38. Adam Chambers is a great example of someone who does the right things. "It doesn't matter what their age is. Sometimes, they just don't know what those right things are, but the sooner that it gets embedded the better. "Don't wait until 28 then suddenly find out. A lot of players do and suddenly think I'd better look after myself."